Image courtesy of Toronto Public Library. When the story of the theft of a first edition of the Book of Mormon broke this past May 29th many members of the Antiquarian Booksellers Association of America, the premier trade organization for professional rare booksellers in the U.S., were uneasy. "There is just a whole lot of bad in this story," was a comment left on Facebook by one. It was not just because the book was stolen. We take a very dim view of book thieves yet drawing and quartering is no longer, alas, an accepted punishment option. No, there were other, more compelling reasons for our discomfort. There is only one reason why rare book news hits the front page of newspapers and that is when a very expensive volume, worth at least six figures, is involved. Big money gets attention. So it came as no surprise that major news sources picked-up a story about a stolen book declared to be worth $100,000. The fact that it was the Book of Mormon and that between Broadway and the Beltway Mormonism is receiving much public attention was certainly a factor. And, too, that the rare book dealer who owned it was an endearing 88-year old Mormon woman and poet, Mrs. Schlie. Major money involved, eight law enforcement agencies, including the FBI, engaged in the hunt, a national dragnet to apprehend the thief and recover the $100,000 book. But the book was never worth $100,000. At the time of the thief's capture the value of the book had declined to $40,000 with no explanation. But even that estimate was too high. Auctions records reveal that since 2007 the average sale price for first editions of Book of Mormon has ranged from $40,000 to $60,000, the copies in not terribly good condition, per usual. Those sales, however, were for complete copies. Mrs. Schlie's copy lacks fifty leaves (100 pages) and as such is near worthless as a collectible first edition. Law enforcement thought it was chasing a thoroughbred. It was actually hounding a dog. Who excised those pages? Mrs. Schlie. For what purpose? To sell the leaves as "heirlooms." Since the mid-20th century, when rare and antiquarian booksellers throughout the world organized national and international trade associations to establish professional standards and codes of behavior and ethics, the breaking-up of rare and valuable books to sell leaves or illustrations is not countenanced. Not at all unusual in prior centuries before the trade matured, the practice is now shunned by all responsible and respectable booksellers. Her copy, prior to removing the leaves, was worth, compared to other copies recently at auction, approximately $30,000. "Concerned that the book was badly worn and that continued deterioration would end its inspiring mission, Helen consulted with experts at the Smithsonian Institute and the National Museum of Art. After much heart-felt prayer and consideration, Helen has determined that the best way to continue the journey of this copy of the Book of Mormon is to have the pages unbound and individually mounted in free-standing double-faced frames so that both sides can be viewed" (from Mrs. Schlie's website). The most recent first edition copy of the Book of Mormon to come to auction fetched $45,000 at Bonham's-New York in 2010. The lower cover was detached, the leaves were browned and foxed, and the corner to one leaf was lost. Two years earlier, in 2008, a first edition copy with both covers detached, spine loose, and text block shaken sold at Sotheby's-New York for $30,000. Mrs. Schlie's copy seems to be in like condition: a train wreck. But because most first edition copies are found in similar states of distress prices remain healthy. Her copy was still viable as a collectible. If she wished her copy to continue its inspiring mission and journey the accepted and proper thing to do would have been to have it professionally restored preserving as much of the original binding as possible, or commission a preservation box to house and protect it as is to maintain what's left of its original integrity. Based upon her price list for leaves, the initial estimation of the book's value, $100,000, is left in the dust. She is offering leaves for $2500-$4500 each. The book contains 588 pages (294 leaves). At the low of $2500, she can potentially reap over $735,000. Nice return on a book worth $30,000 before it was plundered. Mrs. Schlie's underlying purpose in selling individual leaves is to raise money for Mormon missionary work. That is a worthy goal (though I suspect that the LDS Church is doing just fine, financially). But at what expense? She is destroying a copy of the sacred text of Mormonism. As most extant copies (forty-three at auction since 1976; though rare it is not scarce in the marketplace) are in poor condition destroying her copy to preserve it was completely unnecessary. It's no secret that beat-up copies of the Gutenberg Bible were once broken-up to harvest leaves to either sell individually or to replace lost pages in an otherwise sound example. (I had a Gutenberg leaf pass through my hands ten years ago, $60,000 on consignment. And I am aware of a modern dealer who had multiple facsimiles made of a Gutenberg leaf he owned, then cut out individual words from the genuine leaf and inserted them into a window where the same word appeared on the facsimile; he sold Gutenberg Bible words!). The Gutenberg Bible, though the first printed edition, is not the first appearance of the Scriptures. 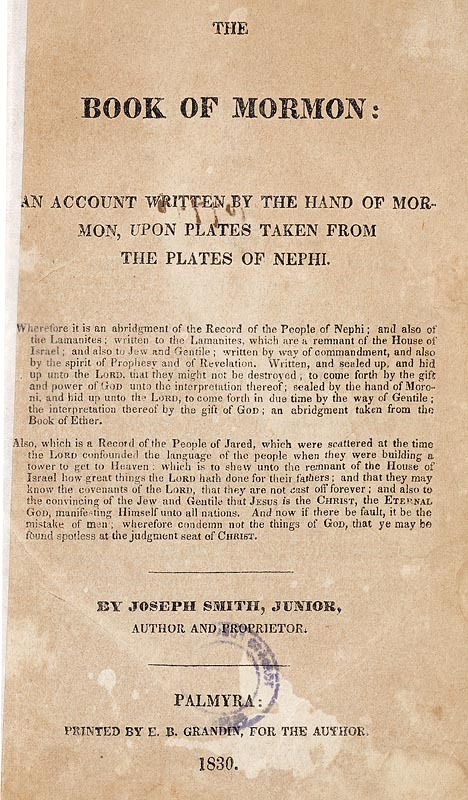 The first edition of the Book of Mormon (Palmyra, NY: 1830) is, however, the first time the complete revelations of Joseph Smith were exposed to the world. Why the Smithsonian and National Museum of Art gave her their blessing to break-up the book is a mystery. I find it inconceivable that they would give Mrs. Schlie the okay to break-up her copy. You would think that they, as conservators of historic and artistic treasures, would try to dissuade her. I suspect they did. Mrs. Schlie does not say what their response was, only that "heartfelt prayers and consideration" followed the consultation, suggesting that they may have said Don't do it and she did it anyway after struggling with her conscience. Note, however, that the Smithsonian and National Museum of Art, experts in their areas of collecting interest, are not experts on rare books. If Mrs. Scheil needed reliable advice she should have considered an ABAA-member rare bookseller with experience selling Mormoniana. (Scroll down to Specialization). She asked a collector-trader to initially appraise her copy. He provided the estimate of $100,000 for a copy in average condition. But the question remains why, since she specializes in Mormon material, Mrs. Schlie required an outside opinion when auction records and current dealer offers are readily available on the Internet? In concert with her admission that she didn't carry insurance for the book or properly secure it (she stored it in an unlocked file cabinet drawer), two basic and essential precautions for professional rare booksellers, one can only conclude that, no matter how nice and genuinely good-hearted this attractive elderly woman may be, Mrs. Schlie has not conducted herself as a professional. Mrs. Schlie is not liable for the inordinate media coverage that has surrounded this story. But she is responsible for declaring a grossly inaccurate market value that got the media's mojo workin', as well as somewhat culpable for not keeping the book safe in the most fundamental manner. She didn't ask to be robbed but she assumed a huge risk and lost. Three cheers to law enforcement for recovering the book. “The first edition is not quite as good as having the gold plates but it’s right next to it," said Brent Ashworth, the collector in Provo, Utah who provided the estimate of $100,000 to Mrs. Schlie. For the record, the only time a first edition Book of Mormon has ever sold at auction for $100,000 or more was at Swann Gallery March 22, 2007. It fell under the hammer for $150,000 (not including premium). Why? It was a monster association copy, that belonging to Denison Root, brother-in-law of Joseph Smith, and signed by Orson Pratt, an early Church apostle. Further, Root's inscription indicates that the book was a gift to him from Hyrum Smith, Joseph Smith's brother. Had that copy been stolen it would have warranted the attention of the media and the extraordinary efforts (and expense) of law enforcement across the country to recover it. But not this one, henceforth to be justifiably referred to as the notorious Schlie copy - or what's left of it, the Schlie scraps, which, if all sell at the minimum aggregate of $735,000, really is almost as good as having the gold plates. There was never a legitimate excuse to break up this copy. Devout Mormons who value the sanctity of their scripture in its original form may wish to politely pass on Mrs. Schlie's "heirloom" Book of Mormon leaves. There is a hidden stain on each of them. SMITH, Joseph. The Book of Mormon. 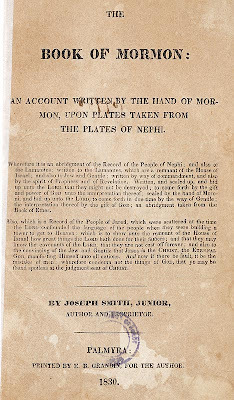 An Account Written in the Hand of Mormon, Upon Plates Taken From the Plates of Nephi. Palmyra, NY: Printed by E.B. Grandin for the Author, 1830. Octavo. 531 pp. Publisher's original calf binding. Howes S623. Grolier, American 37. Sabin 83038. Streeter Sale 2262. Bonhams New York, June 23, 2010, lot 3488. 1st Ed - 1st Issue. Period sheep - worn, lower cover detached. Foxed, browned, 1 corner torn with loss. Serenus Burnet copy - $45,000. Sotheby's New York, Dec 11, 2008, lot 142. 1st Ed. Contemporary sheep - spine loose, covers detached, text block shaken, titlepage loose. , $30,000. Christie's New York, Dec 5, 2008, lot 290. 1st Ed. Contemporary sheep - spine chipped, rubbed, lower cover wormed. Foxed. John Preston-Augusta Gibbons-Julia Cullen copy/ $48,000. Pacific, Jan 24, 2008, lot 107. 1st Ed. Original calf - front pastedown holed, scuffed, darkened, chipped & joints cracked. Some foxing. $70,000. Christie's New York, Dec 3, 2007, lot 192. 1st Ed. Modern half morocco gilt. Titlepage creased with pencil marks; some browning & spotting; without the extra leaf of Testimonies, final blank & index. $45,000. Pacific, Oct 11, 2007, lot 247. 1st Ed. Original calf - rebacked, worn & hinges reinforced. $90,000. Christie's New York, June 19, 2007, lot 283. 1st Ed. Contemporary sheep - spine ends chipped, front cover bowed, circular stain on front cover. With the extra leaf of testimonies. Lacking final blank. $55,000. Swann, Mar 22, 2007, lot 204. 1st Ed. Original calf - worn, tear to front free endpaper. Titlepage & endpapers browned. Signed by Orson Pratt. Denison Root copy, presented to him by Hyrum Smith. $150,000. Skinner, Nov 19, 2006, lot 477. 1st Ed - 1st Issue. Original calf - worn & chipped. Spotting throughout. $75,000. Christie's New York, June 14, 2006, lot 588. 1st Ed. Original sheep - old library shelf label on spine, rubbed, hinges tender. Pencil marginalia; some browning & spotting; a few pale stains. Buell - Thomson - Knight - William Carey College copy. $60,000. Excellent post. These issues had been troubling me since I first heard of the theft. Thanks for filling in the blanks..
Great post Stephen. Even handed but you pull no punches on a case that so well illustrates the differences between professional dealers and -in this case- those much less than professional. You leave off where another interesting story begins, the story of the person charged with the crime, who turned out to be a longtime friend of Mrs. Schlie, and who is in the business of selling facsimile edition of the Book of Mormon. Combine this with the broken book and the possibility of a Romney Presidency, and you have an edition of a potentially very expensive leaf book. I do wonder if the book was truly "stolen" or if this was just a business deal gone sour. Very well done. Oh, P.S., a mediocre copy went this past April at Bonham's for $46,250 including premium. Break 'em all. Damn tchochkis.